Thermo TapeTM is a reversible indicator that changes color at the specified temperature and reverts to its original color when cooled. It can be used repeatedly. 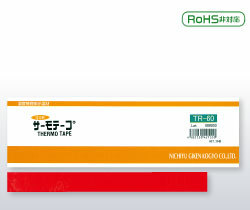 Both sides of the tape retain the original color (before changing), making any color change due to a rise in temperature obvious at a single glance. As a tape, it can be cut into strips of any length.